You might think I’m crazy. But I got off the plane, and got my luggage and got into my rental car. And I got on the highway and my GPS told me that I was going to be on one highway for 9 miles. So I called Mer to tell her I was on my way. And it was the first time I ever talked to her on the phone! I mean, I just got off a nearly 1,000 mile flight, and I’m talking to her on the phone. Let me also say that I don’t do well talking to people for the first time on the phone, and I don’t do well meeting people for the first time. It’s the shy thing kicking in and taking control. And that day, I NEVER had a problem. And then two hours later, I was there. In Kentucky. With/Meeting my friend. I called my mom, because ya know, parents get nervous when you jump on a plane to go meet someone you met online. Chow Wagon eating Greater Taters, and mine must have been made the biggest potato in the world. Karen, you were right. It was like I had known Mer forever. 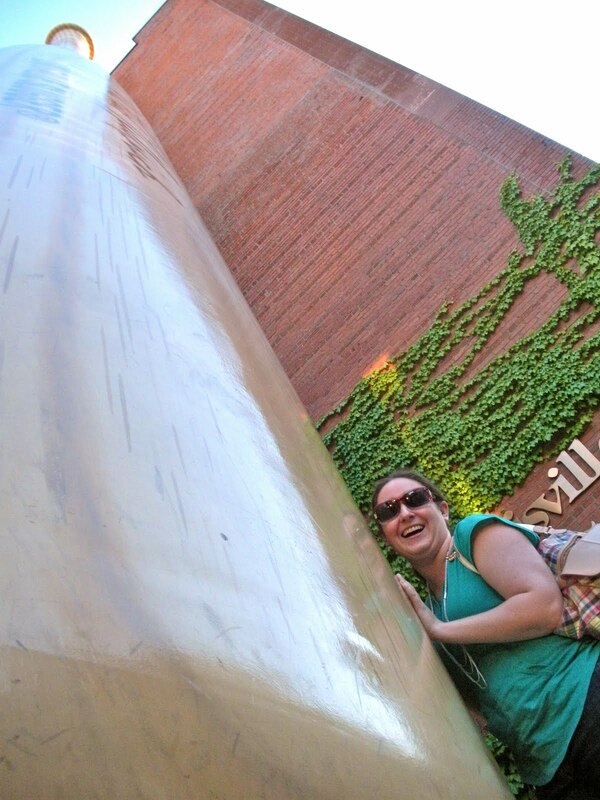 And then we went and did all sorts of touristy things. Like the Chow Wagon. And the biggest bat in the world. And Lynn’s Paradise Cafe. And seeing the Garland of Roses which is made at the grocery store. This was crazy to me. I assumed it was made at a fancy florist, but I guess it was fancy since the grocery store had ribbons everywhere. On Saturday, I did nothing but eat, and eat, and eat. (Oh, you’d like to know how my diabetes reacted?) Well first, I ate chips and guacamole, chicken burrito, chocolate chip cookies, some sort of strawberry dessert deliciousness, Derby pie, broccoli casserole and more. And! I never went over 300. I call that success. But even more awesome was that, was the feeling of meeting people who included me as though I had been there time and time before. Even though some people were disappointed I didn’t say Bahston. And we wore fabulous hats. And Mer won the prize (are you surprised?). This is thing that I find most amazing about the Derby. It isn’t just one race. There are races all day. And there are even races on the turf. I had no idea! I’m not a horse person, never have been and never will. And yes, I’ve tried for the sake of my cousins, but no, its not for me. However, this was awesome. So the fact that I was there for Derby was kinda crazy. On Sunday, (Mother’s Day – sorry mom! 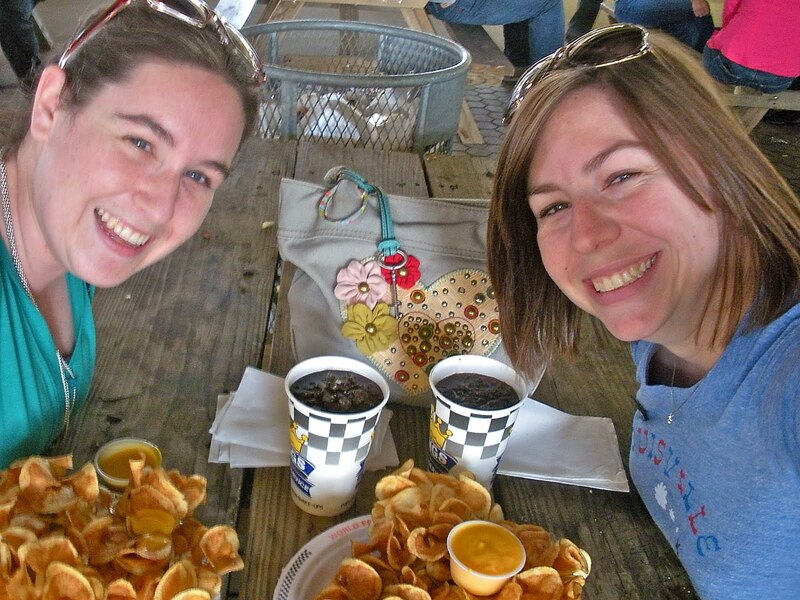 ), we went out to brunch with Mer’s parents and I experienced southern fried food. And lots of people watching. 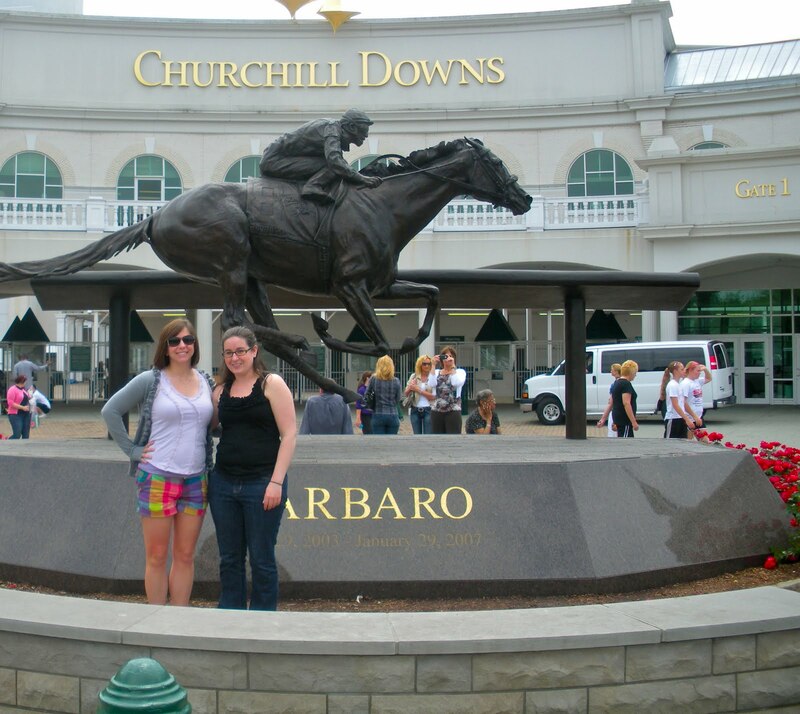 And then we went over to Churchill Downs. It has always been this place that I see on TV once a year, and then, that’s only been within the past few years when there’s been a fundraiser at my uncle’s bar on Derby Day for a therapeutic riding center. The hats, the betting, the racing: I had no idea. Churchill Downs is so impressive though. It’s also incredible to me because I love doing things I never imagined doing. And flying down to Kentucky is definitely one of those things. Thank you Mer for such an amazing weekend! On Sunday as we were hanging out in her apartment, we were talking about DBlog Week, and we both came up with how awesome it would be, but also how it was going to get in the way of telling everyone about our weekend together. What I like to call an ultimate DOC meetup. It certainly went by way too fast, and now it feels like I should be able to call you up and say “let’s get together!” Except that’s the problem with far away friends, you can’t do that. This is sooo awesome!!!! 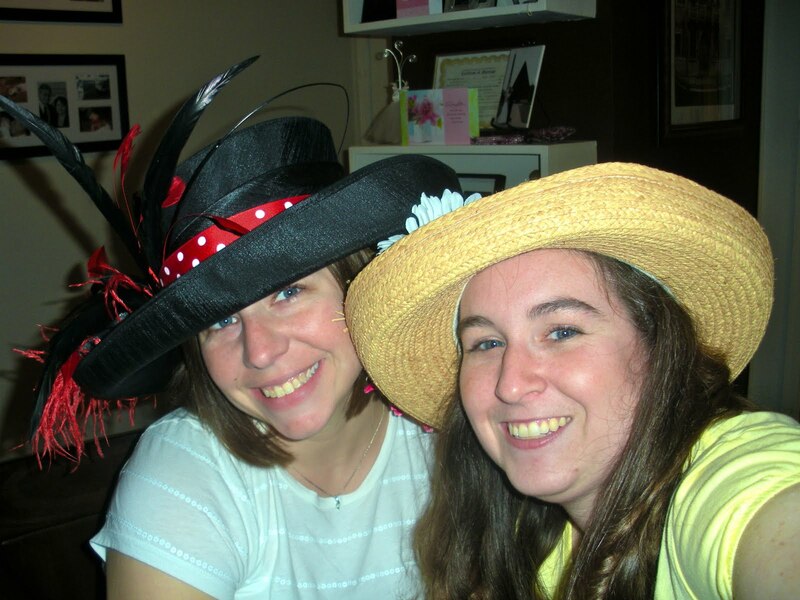 Glad you two got a chance to connect for an Ultimate Meetup on Derby Weekend, and it was so much awesomeness – (great hats, by the way!) That's what is so awesome about the DOC, meeting such great people and feeling like forever friends. Good stuff. Thanks for sharing, even if it came after the adventurous blogger-crashing D-Blog Week! How cool! I am so happy you two could meet up! There really is something special about the DOC. Yay yay yay!!!! Isn't meeting on-line d-pals the best!! See, it's like you've known them forever!